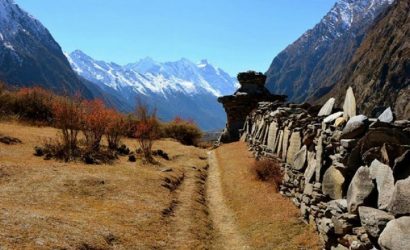 Manaslu Circuit promises you to give a completely enthralling experience. This circuit has been gaining popularity for some time now and it deserves it. 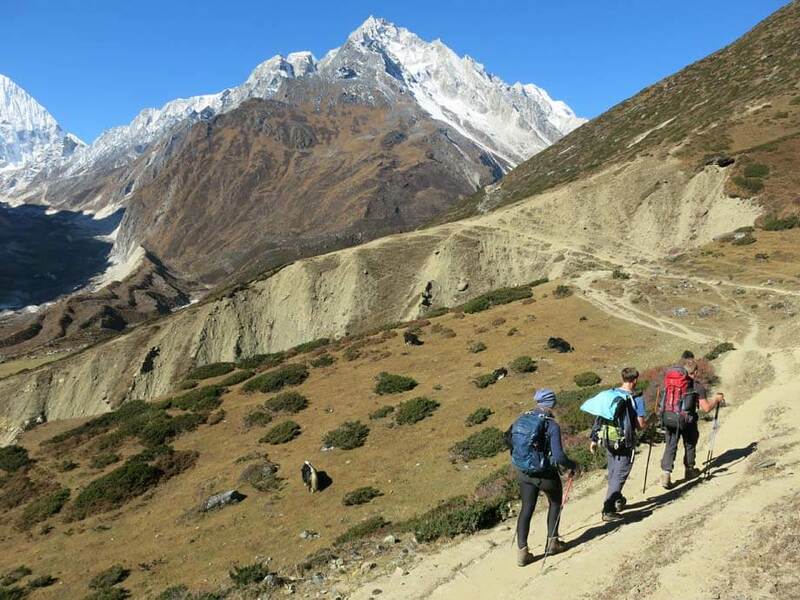 Trekkers come to experience the pristine and untouched environment. 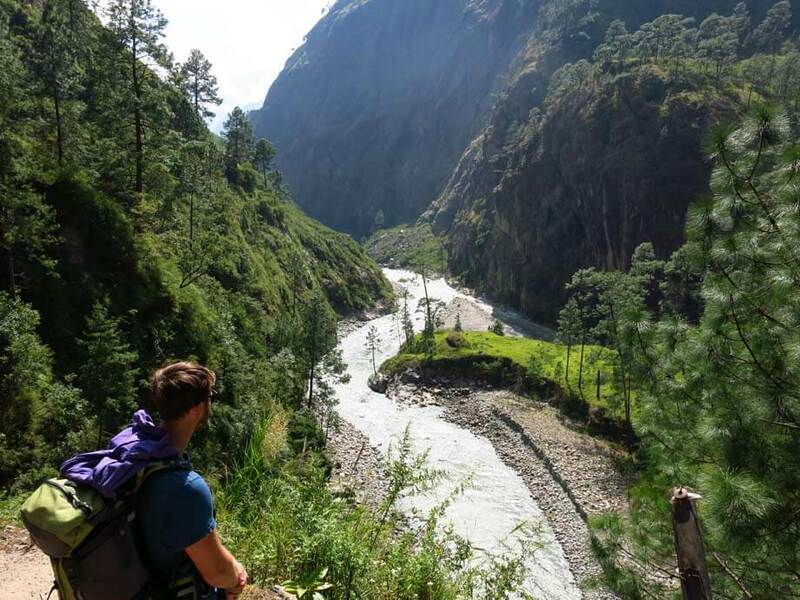 This trek is a bit difficult when compared to few treks but it is an exciting one nonetheless. 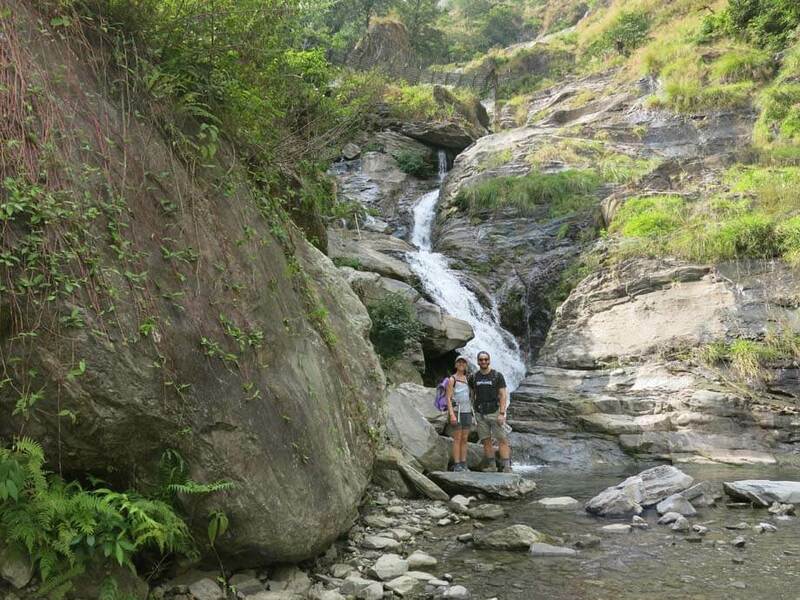 We will be trekking from one village to another and witnessing the exemplary flora and fauna of this region. This route will treat you with the rare sights of wildlife. The glorious view of the mountains and the sacred culture of this land will make your experience an unforgettable one. You will also come across the ruins of old civilizations. 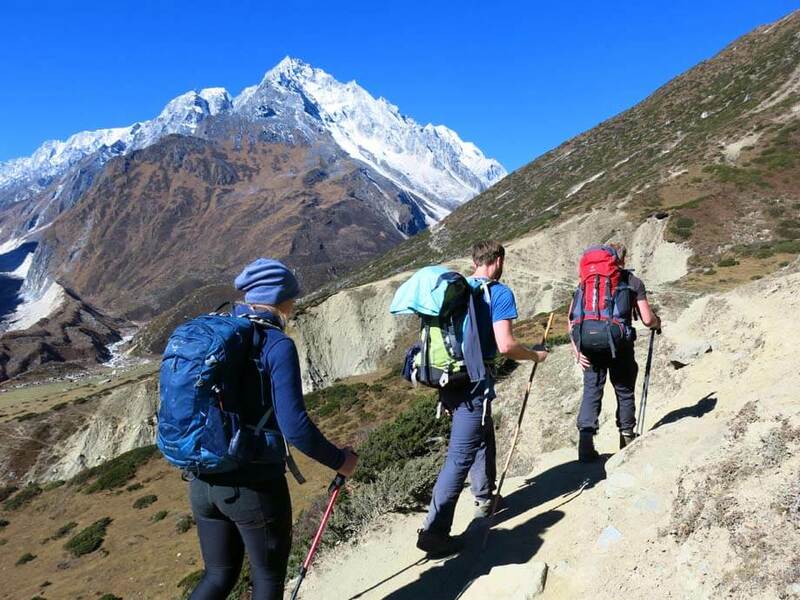 This trek has it all and guarantees front seat tickets for the spectacular view of Mount Manaslu. After you arrive in Kathmandu, we will rest for the night and on the following morning, we will head to Soti Khola. After spending the night in Soti Khola, we will start our trek and reach Machha Khola. In the evening, we will enjoy the authentic local food. 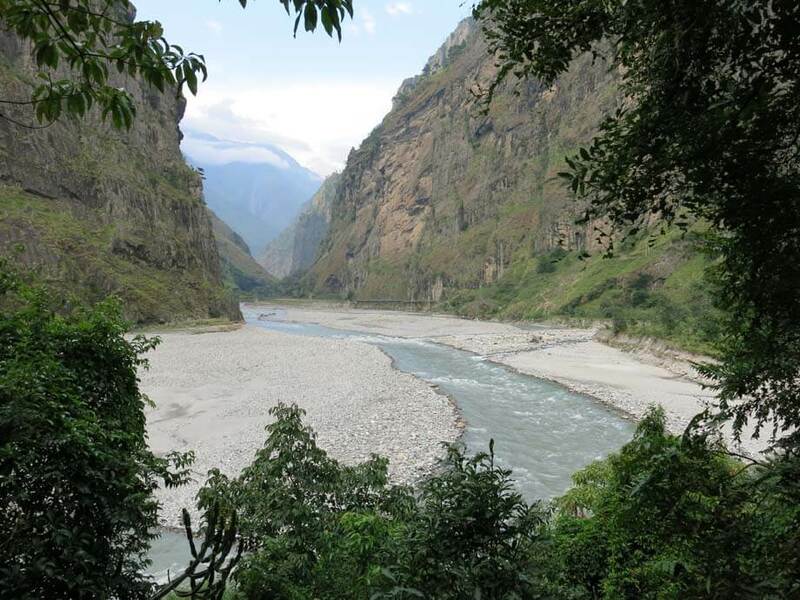 Then we will head to Yaru Khola and on our way, we might get lucky and spot some wildlife. We will come across several villages including Jagat, Deng and then to Namrung. On the eighth day, we will reach Samagaon. 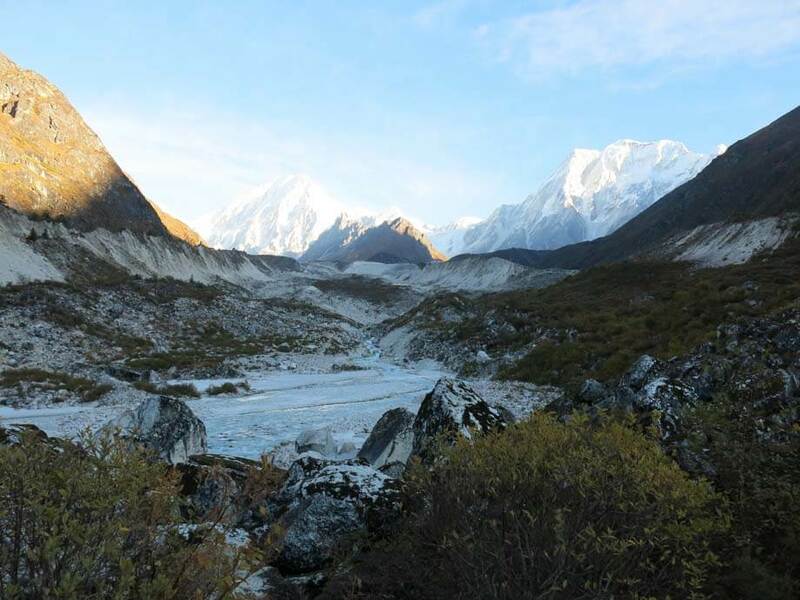 From Samagaon, we will witness the spectacular view of the Manaslu Glacier as well as the Manaslu mountain. After we reach Dharamsala (Larkye Phedi) via Samdo, we will be at an altitude of 4460 meters. 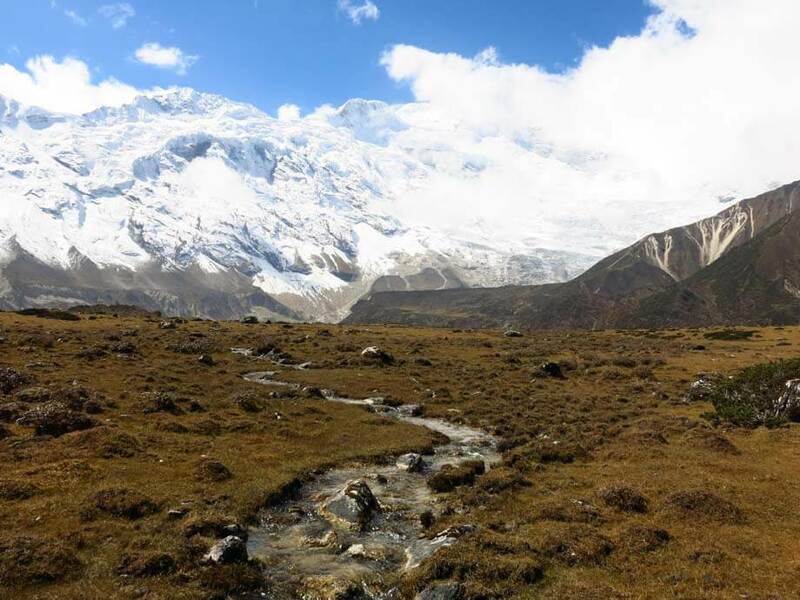 The most exciting phase of the trek will be realized when we cross Bimthang via the Larkya La Pass and Glacier. The altitude at the Larkya La Pass is 5160 meters. This pass offers you a spectacular view of the mountains. We will then descend to Bhimtang and continue our journey until we head to Tilje. From Tilje, we will go to Tal and then to Jagat. On the 15th day, we will take a bus back to Kathmandu. This trek comes with a full package. You will walk through a remote region laden with a pristine environment. 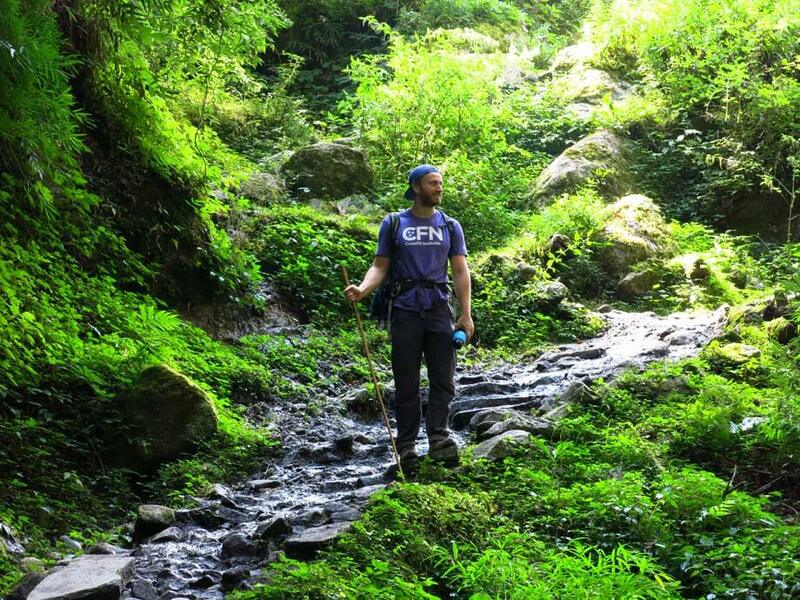 This trek is strenuous but a perfect one if you’re up for an adventure. Crossing the spectacular Larkye La Pass, at an elevation of 5160 meters. The bus ride which will give you scenic views of the landscape of Nepal. The unique culture of this region. 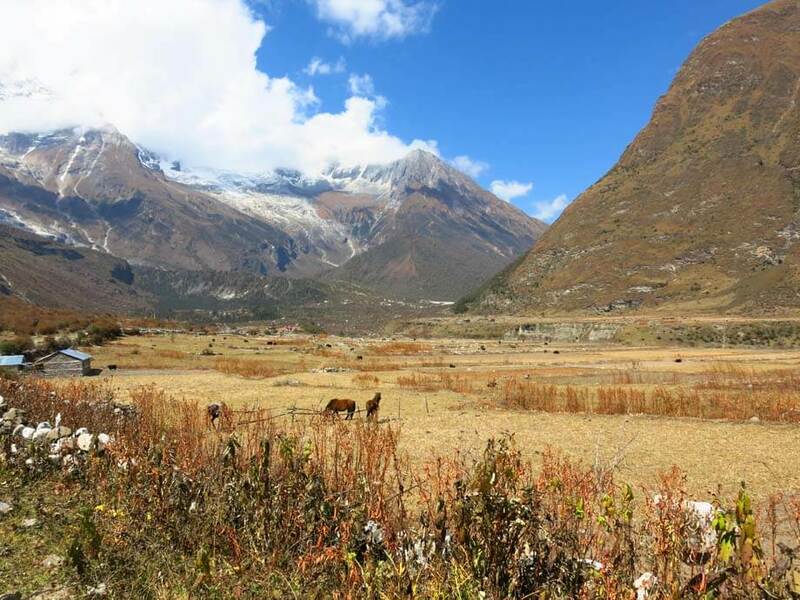 Flora and fauna of the Manaslu region. Our representatives will be at the airport and after your arrival, we will head to your hotel. You will need to rest after a long and tiring flight. Later in the evening, we can go Thamel to have a fine evening. Enjoy the food and you will be staying at a 3-Star hotel in Kathmandu. On this day we will prepare for our trek. 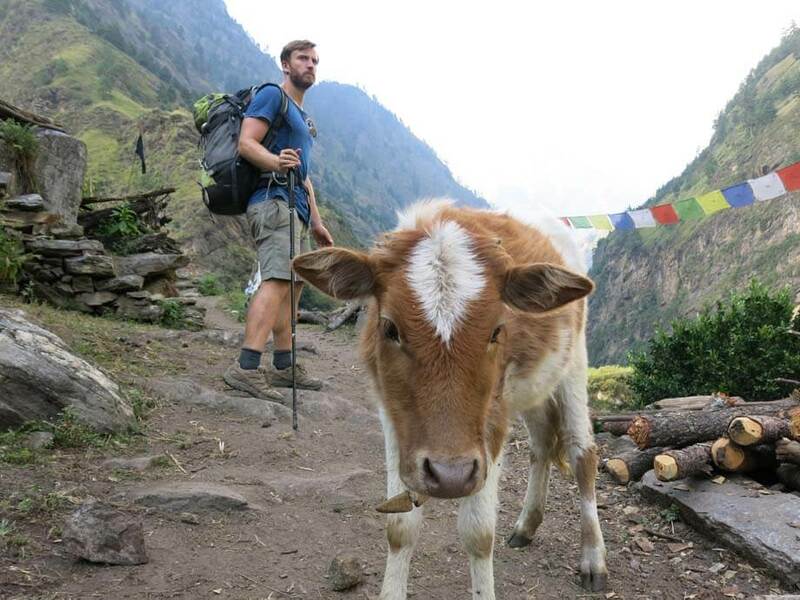 We will talk to our guide and make sure we are ready for this strenuous trek. Later, we will visit several UNESCO World Heritage sites in Kathmandu. Sites like Kathmandu Durbar Square, Swayambhunath, Boudhanath, Pashupatinath Temple, Patan Durbar Square, and Bhaktapur Durbar Square. We will spend our night in Kathmandu. 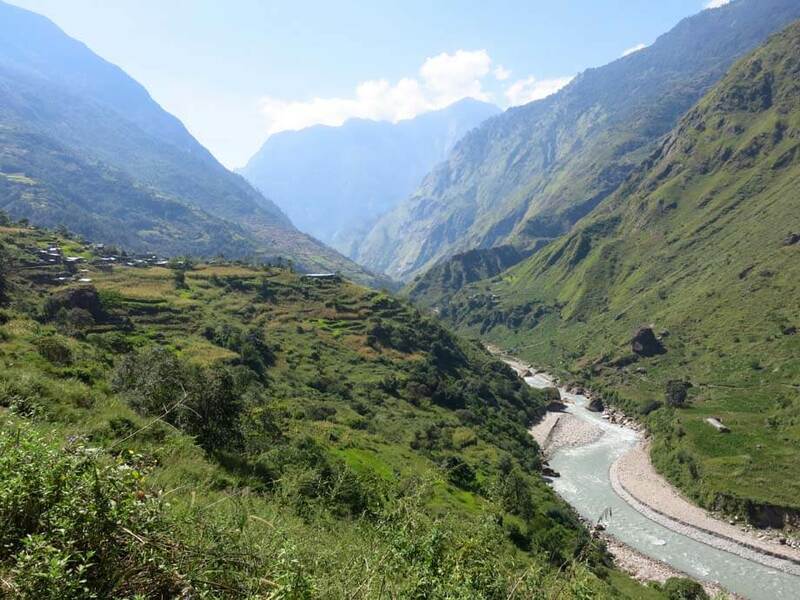 On the third day of the trek, we will head to Soti Khola. It is a total of 8 hours drive and as we pass through Arughat. You can enjoy the bus ride as it offers you the view of village fields and farmlands. We will cross Dhading Besi and take an off-road route to get to Soti Khola. After driving a total of 8 hours, we will finally reach Soti Khola. We will spend the night in Soti Khola, located at an altitude of 710 meters. The trekking on this day is much demanding. There will be few moderate climbs as we head out from Soti Khola. We will take a forest trail and will cross few suspension bridges. We will walk past many pasture lands and fields on the edge of the forest trails. After walking for about 5-6 hours, we will finally reach Machhakhola where we will rest for the night at a humble guesthouse. On the fifth day, we will come across several uphill and few downhill paths. After walking for an hour and then crossing the Tharo Khola, we will get to the village of Khorla besi. 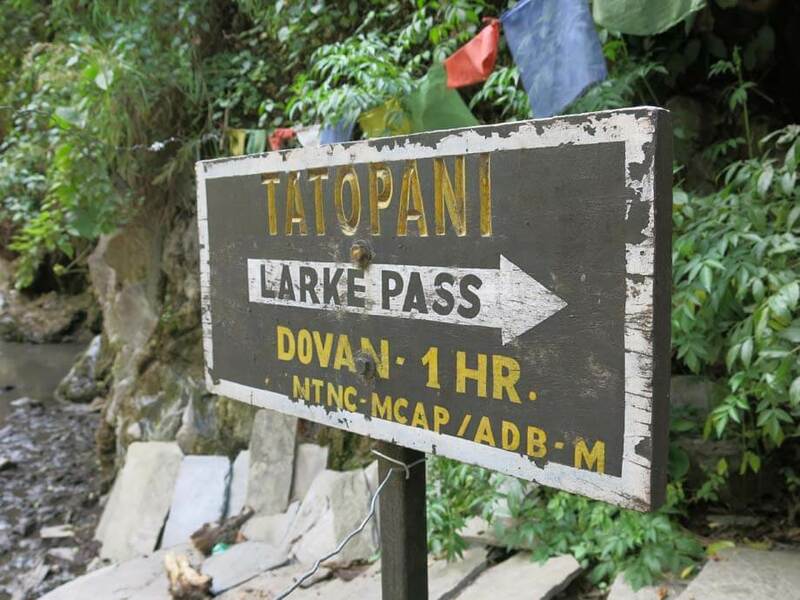 A gentle incline will lead us to Tatopani which has natural hot springs. 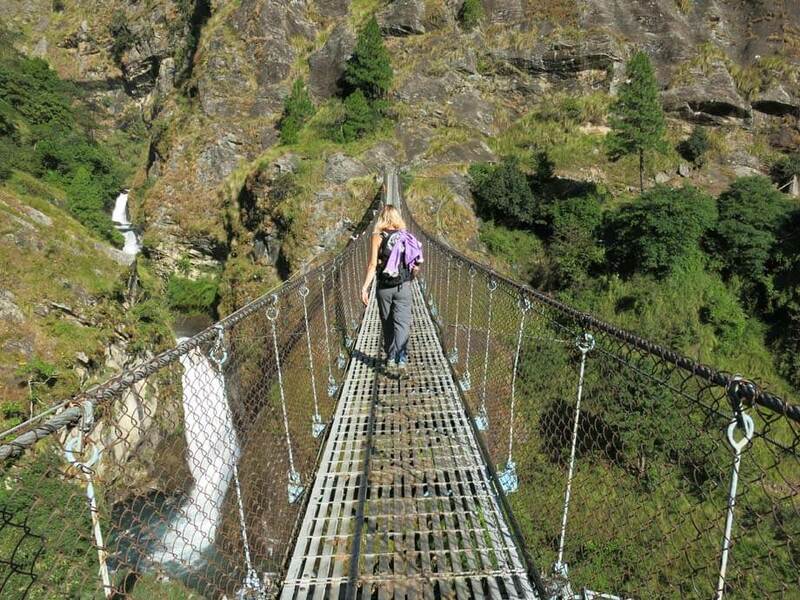 Later we cross a ridge and then cross the suspension bridge which goes over Budhi Gandaki river. We will carry on with our journey until we reach Dobhan. 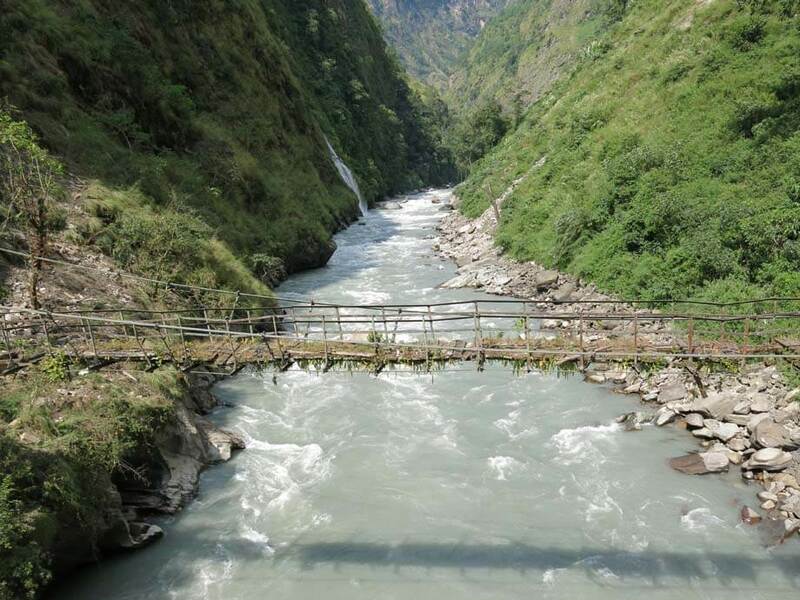 We will then cross the suspension bridge which goes over Yaru Khola. 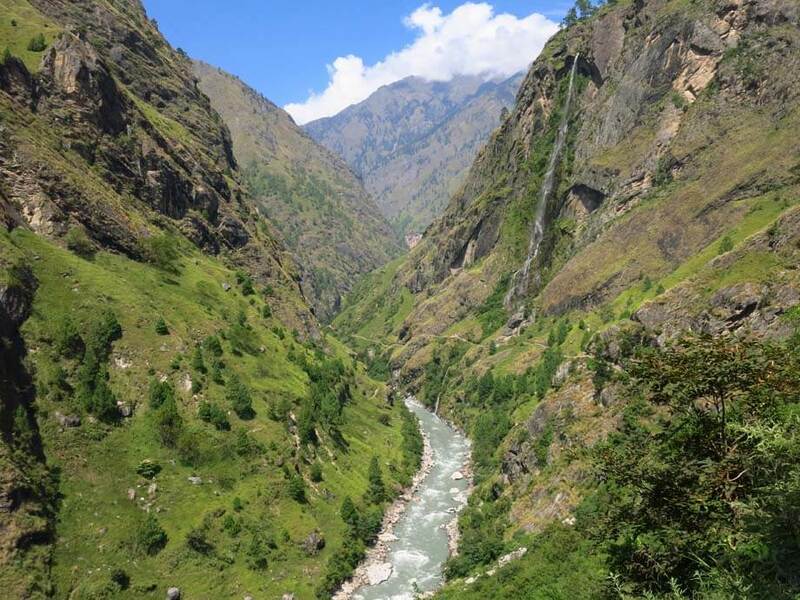 We will then take a steep decline until we reach the banks of Budhi Gandaki and then reach Jagat. 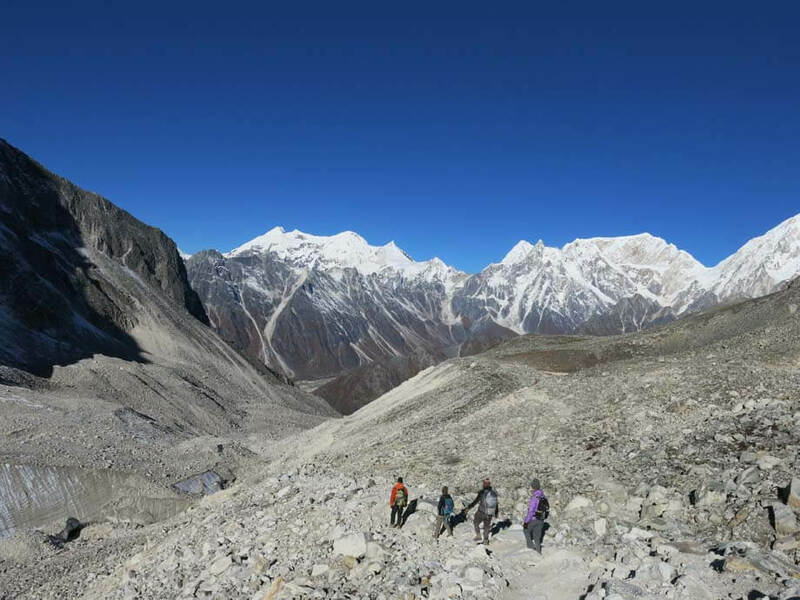 On this day we walk for about 6-7 hours and spend the night in Jagat situated at an altitude of 1410 meters. We will head to Deng on the sixth day. We will initially take the uphill trail which leads to flatland after a while. We cross the Budhi Gandaki river again. This indicates we have entered Philim. 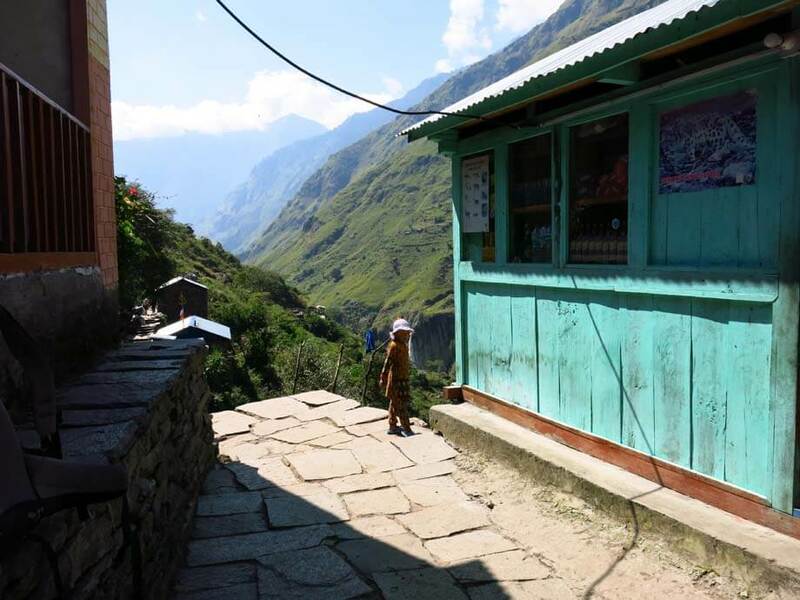 In this village, you will see people of Gurung community. This village has several small monasteries too. On this day, we will also cross through several forests of Rhododendron trees. We will walk a total of 6 hours on this day and rest in Deng(1804m) for the night. 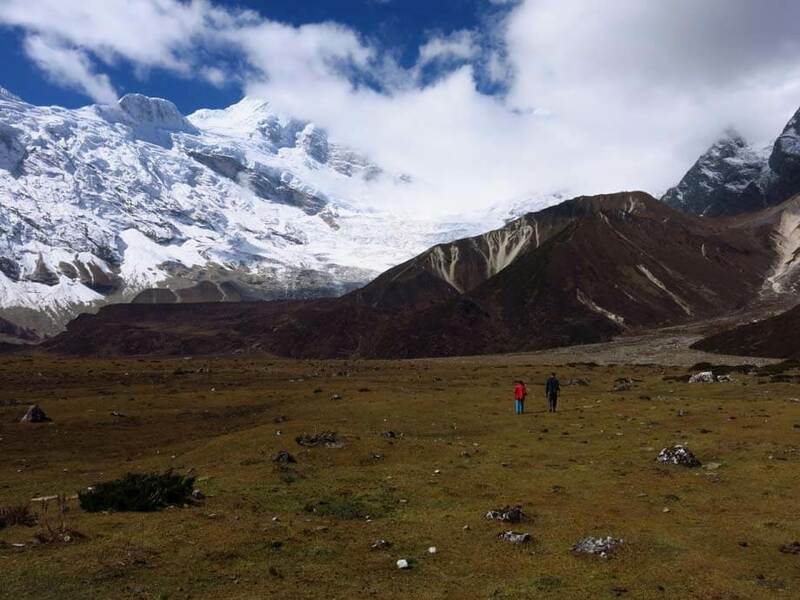 On the seventh day of the trek, we will be crossing the 2500 meters mark as we reach Namrung located at an altitude of 2630 meters. 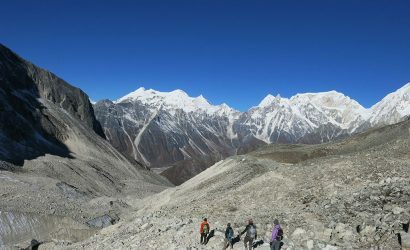 On our way to Namrung, we will come across spectacular trails that will give an idea about the things to come and how exciting and challenging this trek is going to be. We will also cross several villages in which the ethnic group called the Gurungs live. There are few numbers of gompas and monasteries in this region. You will realize how beautiful this region is, naturally as well as culturally. We will walk a total of 5-6 hours on this day. The trail now becomes exciting as we head towards the 3500 meters mark. 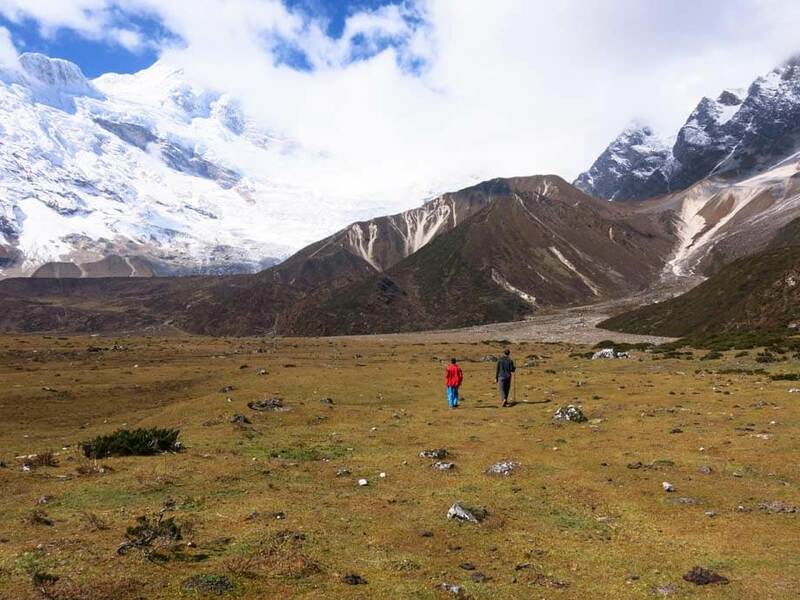 On this day the increase in altitude will be about 900 meters, but we get a spectacular view of Mount Manaslu which will be a treat after about 6 hours of walking. Samagaon is famous for being the stop where you can have an unhindered view of the mountains. Samagaon is situated at an elevation of 3530 meters. On this day, we give our body a well-deserved rest and let it acclimatize to the change in altitude. There are monasteries laden with prayer flags, chortens and mani walls, a perfect depiction of the Buddhist culture. We will explore surrounding areas for about 6-7 hours this day and we return to Samagaon for the night. We will wake up early in the morning to catch the spectacular sunrise. We will then leave for Samdo. This trail from Samagaon to Samdo is not very difficult. 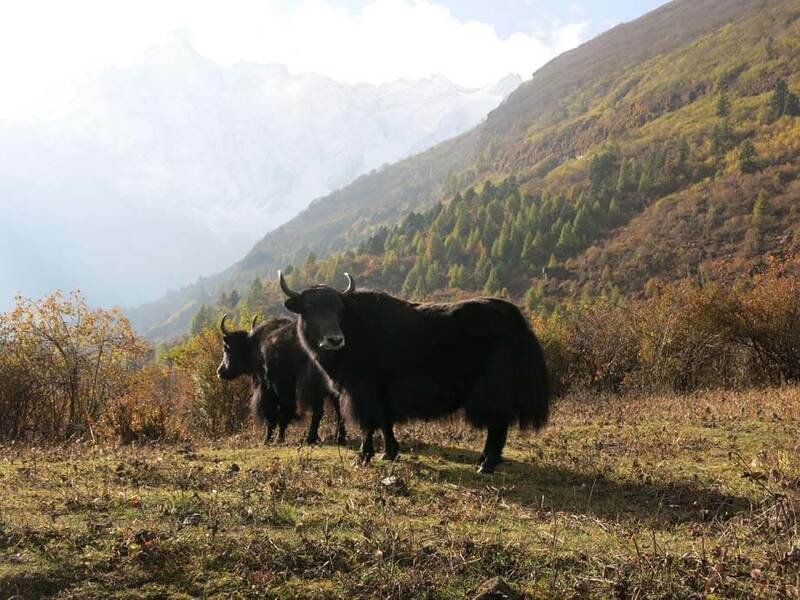 We will come across massive pasture lands where you can see yaks grazing. We will also catch the view of other mountains. On this day, we will walk a total of 4 hours and will rest in Samdo at an elevation of 3860 meters. On the eleventh day of the trek, we will finally cross the 4000 meters mark and reach a total of 4460 meters to reach Dharamsala. 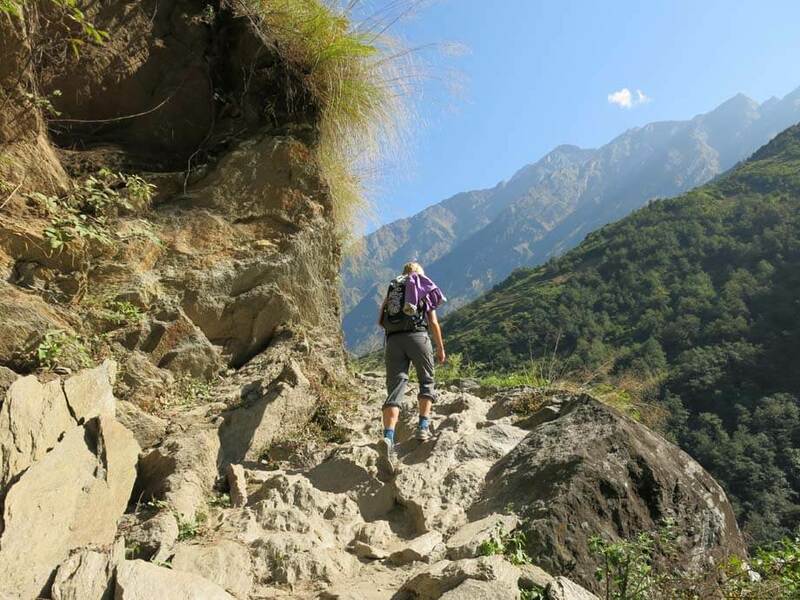 The trail to Dharmasala is beautiful and we will also see an exceptional view of the mountains. Dharamsala was once an important trading village. Now, it has become a resting point for trekkers who come to cross the Larke La Pass. On this day we prepare ourselves and go to bed early so we can leave early next morning. 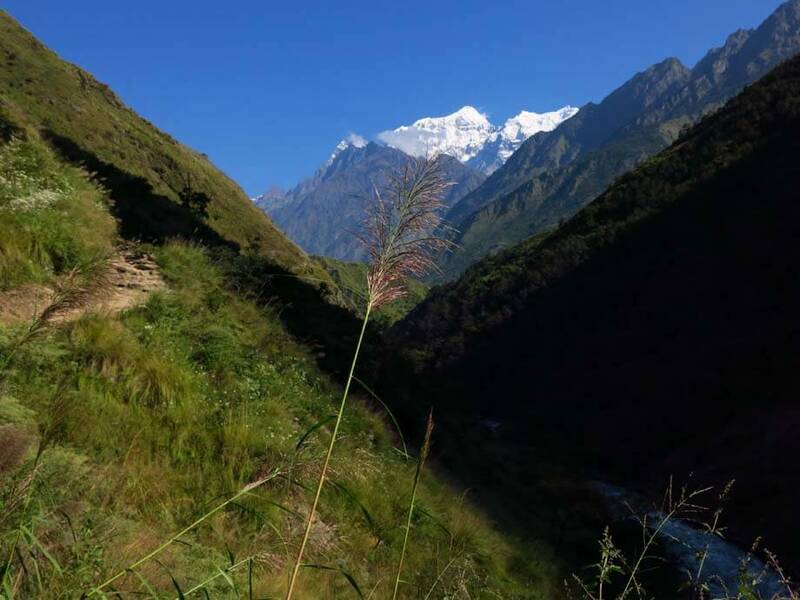 Day 12: Dharmasala to Bhimtang via the Larke La Pass. 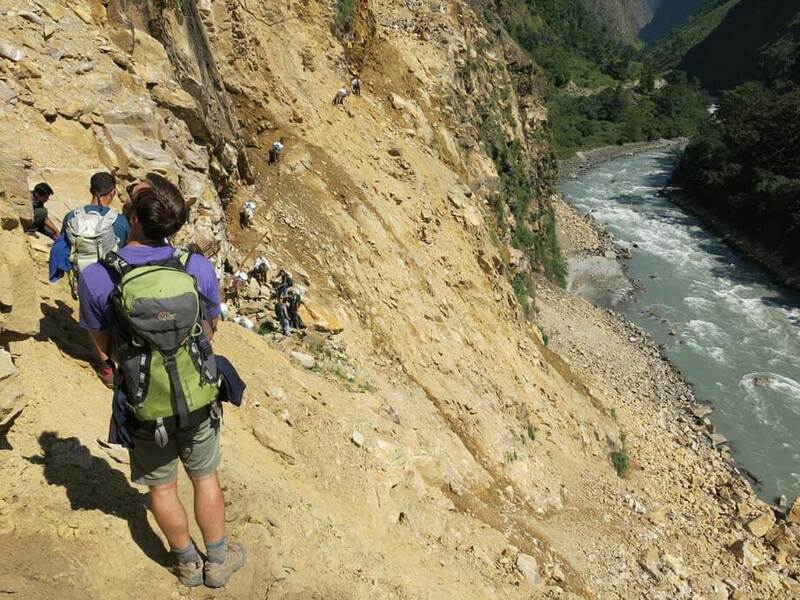 The twelfth day of the trek is the most important day of our trek. 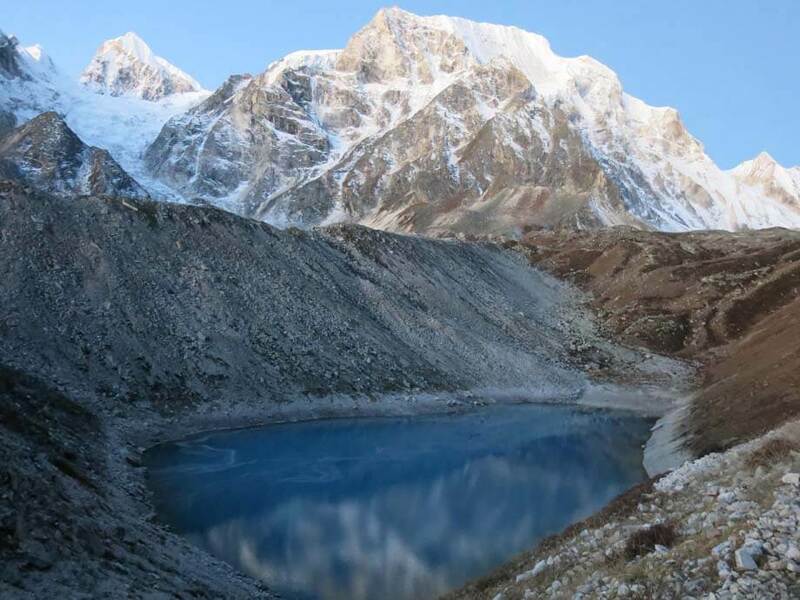 We will be crossing the Larke La Pass, the highlight of the trek. This renowned pass boasts an altitude of 5213 meters. It is quite difficult but an awesome experience. 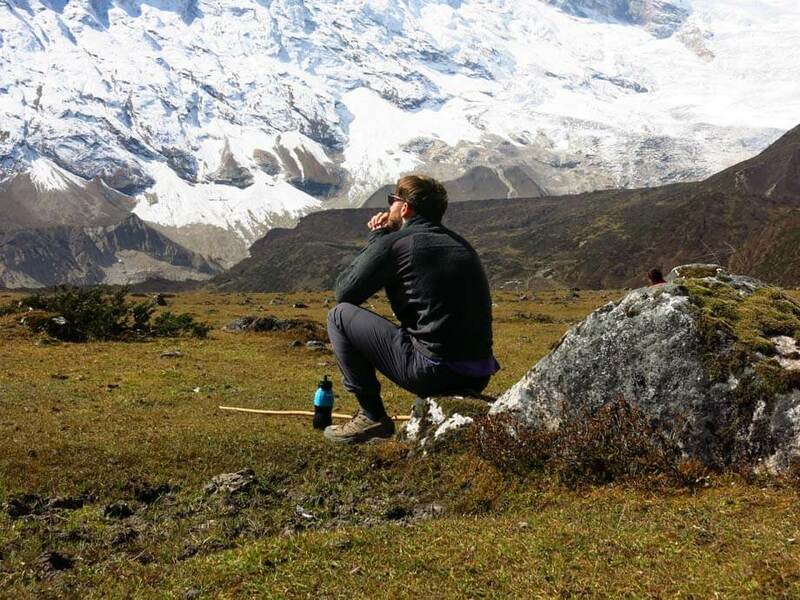 We will see some spectacular views of the mountains like Himlung, Annapurna II, Cheo Manaslu among others. 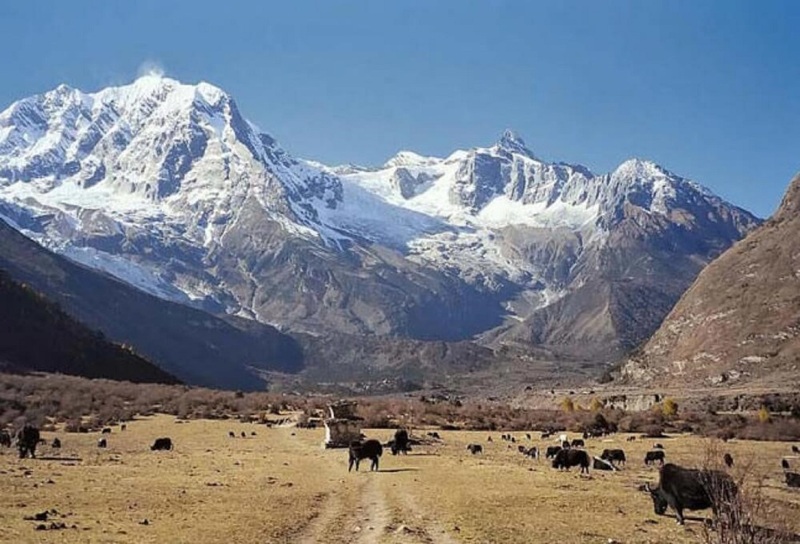 After crossing the majestic pass, we will head to Bhimtang located at an altitude of 3720 meters. On this day we will walk a total of 6-7 hours. This will be the final day of trekking for us. On this day we will head to Jagat. The trail gets simpler and less challenging. We will come across few spectacular waterfalls. We will also come across few small settlements. After about 4 to 5 hours of walking, we will reach Jagat located at an altitude of 1300 meters. We head back to Kathmandu on this day via Besisahar. It will take about 9 hours to get back to Kathmandu. Later in the evening, you can go for your massage and spend some quality time as it will be your last night in Nepal. You leave the homeland on this day. Share your memories of Nepal with your near and dear ones.